Scroll down for a great selection of School Medals. Each school medal includes a neck ribbon. Scholastic Subject Medal with Front ImprintIncludes subject imprint on front of medal. 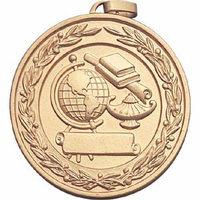 TrophyCentral has an industry-leading selection of medals to meet all of your academic needs. 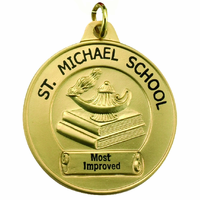 If you are looking for a quality school medallion or medal, you have come to the right place! Medals are available in several sizes, starting from 1 1/4" in diameter for our inexpensive budget medals up to over 2". Depending on type, they may be available in a gold, silver or bronze finish, a color finish, or both. Each recognition school medal features a FREE NECK RIBBON - we have a huge selection to choose from, so you should be able to easily match your school colors! If you have a hard-to-find school subject, be sure to see our Inserts. Inserts are 2� discs that are available in a huge number of titles. Inserts can be used to create a unique medal, plaque or even a trophy and are available in gold / silver /bronze or full color! We have many generic inserts as well, for example, star performer and rising star.